"Plan of aid for the purchase of efficient cars" is a new law that the Spanish government, headed by its president Mariano Rajoy, passed last Thursday. The plan provides incentives of 2,000 euros for the purchase of a car in exchange of leaving a car of more than twelve years. But that amount could ascend up to 8,000 euros in the case of the hybrid and electric vehicles during the months of October and November. These new aid in the current situation that is happening Spain lack logic. The biggest problem of the Spanish economy is the unemployment rate in September was about 25% of the population. - 2,000 euros for vehicles with electrical autonomy of 15 and 40 kilometers. - 6,000 euros for vehicles with electrical autonomy of 90 km or more. Remember that RD 648/2011 is an ancient law dated 9 May, 2011 which is still in effect until November 18, 2012. These are two different laws. These two laws can be applied simultaneously. In this way, with the entry into force of the PIVE (Plan of aid for the purchase of efficient cars) this Monday, until the next November 30 the two aforementioned incentive programs to the purchase of hybrid and electric cars will coexist. However, the registrations of new passenger cars in September have confirmed that this was the worst month of the Spanish automobile market, with a record of 35,146 units. This data, according to the manufacturers of automobile associations (Anfac) and sellers (Gamvan), a decrease of 38.6 % on the 55,572 registrations of the same month in 2011. These data demonstrate that the aid that predicts the Spanish state are directed to reactive the purchase of new vehicles. 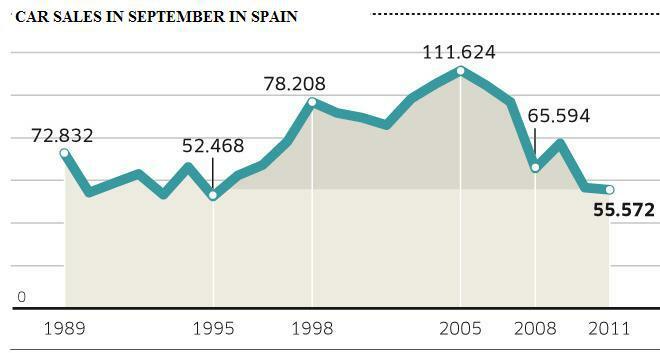 The data of the registrations for September are known coinciding with the entry into force of the Plan PIVE of aid for the purchase of cars, which, according to Anfac and scouting locations, will allow the Spanish State to collect three euros for every euro invested. The program is EUR 75 million of budget. 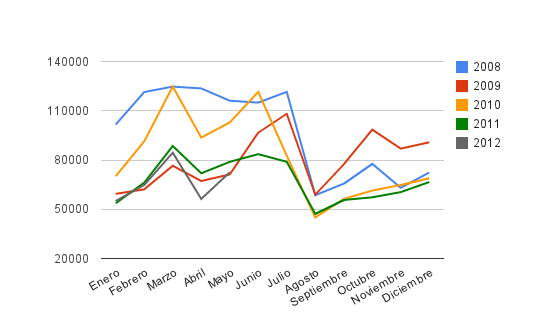 Historical Chart "Car Sales in Spain"
In this graph can be checked as during the months of October and November sales of vehicles started a new impetus. This new law will support moderately the recovery of the sector. Ford Motor Co. (F), General Motors Company (GM), PSA Peugeot Citroen (PEUGY.PK), Suzuki Motor Corp (SZKMF.PK), Kia Motors Corp. (KIMTF.PK), Volkswagen AG (VLKAY.PK) SAAB AB, Toyota Motor Corporation (TM), Tata Motors Limited (TTM), BMW, Renault are the most favored companies because of its strong position in Spain. This new law could allow companies in the sector to recover the lost sales of the year during the months of October and November but the situation in Spain is on the edge of the economic abyss. The country will likely begin the steps to request a rescue to the European Union. Good to know about that,its really a great effort shown by the Spain to purchase the efficient cars,its better for their economy and with this it builds good relations with the other countries.Nice work doe on the blog,its very informative.However if you want to check the Vin of your vehicle so have a look on vehicle id number. It helps you a lot in this matter. The efficient cars will be a great alternative. This makes it possible to reduce a budget. This innovation will be popular among the car enthusiasts.